Perpetual licenses only support the version of the product for which they were purchased. To be able to use a newer version of the product, you must purchase and activate an upgrade code. Likewise, if the product for which you have a perpetual license has more than one edition (ie: Harmony), and you want to upgrade from a lower tier edition to a higher tier edition, you can purchase and activate an upgrade code to upgrade your product edition. 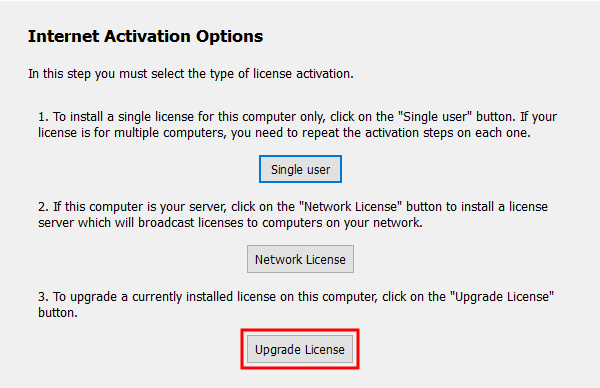 You can upgrade the license on your computer by activating this upgrade code. 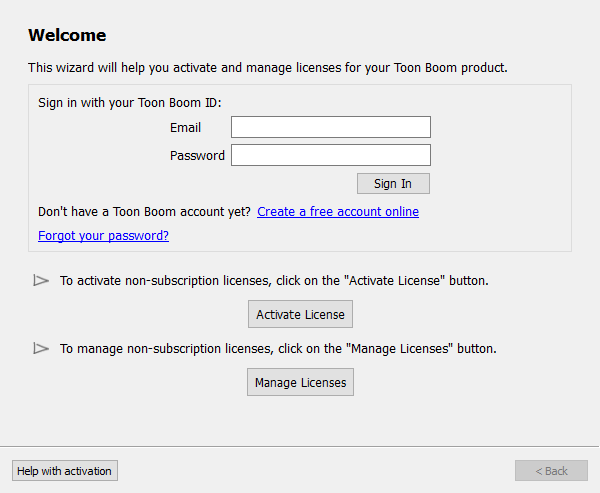 When you use an upgrade code to upgrade a Toon Boom product, the previous license is returned, then converted to a license for the newer version of the product, which is then activated on your machine. The new license also allows you to run the previous version of the software. Once an upgrade code is activated, it permanently converts the license for the older version of the product to a license for the newer version of the product. This license will have a different product code, which will also be available in the My Downloads section of your Toon Boom account. Activating an upgrade code requires a direct connection to the Internet. Make sure that you are not connected to a proxy and that your firewall or network is not configured to block access to the Internet. To prevent connection issues during the upgrade procedure, it is recommended to return your old license before activating your upgrade code—see Returning a Local License via Internet. The Internet Activation - Upgrade License screen appears. In the Upgrade Code field, enter your 18-digit upgrade code. 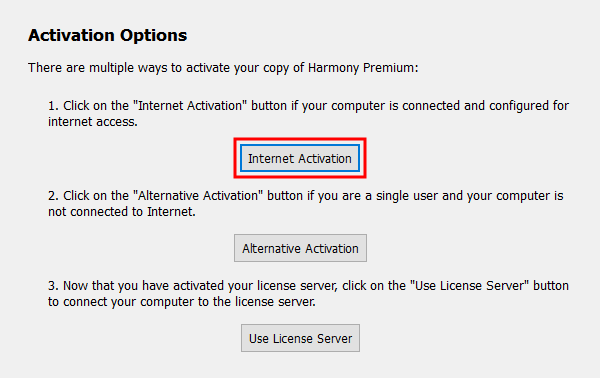 Click on Activate, then wait for the activation server to validate your upgrade code. If the license you are upgrading is still activated on your machine, it will be returned. Then, a license for the product you are upgrading to will be activated on your machine. 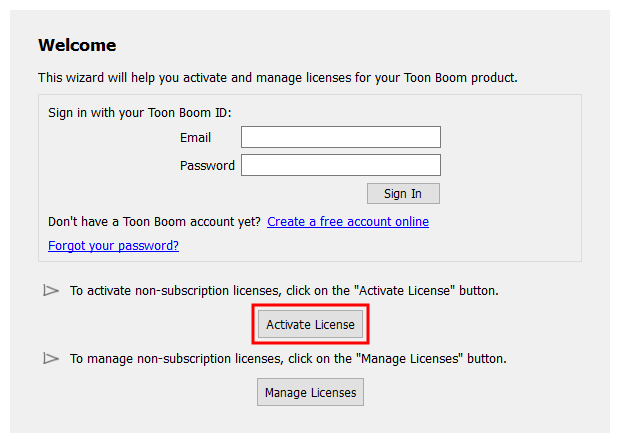 NOTE Once a license is upgraded, its product code can be found in the My Downloads section of your Toon Boom account. You can also view its product code by accessing the Manage Local Licenses or Manage Network Licenses dialog of the License Wizard—see Viewing Activated Local Licenses. If you return the upgraded license, you can activate it on a different machine by using either the upgrade code or its actual product code.